My working friends think I have unlimited free time because I’m retired. Hell, before I retired I thought I’d have a time bonanza too. It didn’t work out that way. I’ve got so much I want to do that I fantasize buying Microsoft Project to run my life. Living by impulsive is turning out to be frustrating. It’s low stress, something that my inner-hippy loves, but totally unproductive. Everything we do takes time. It’s much easier if we only have one passion to single-mindedly chase, because it’s then a snap to know how to apply our free time. But if you chase many goals, that takes juggling. For example, the other day I got an ad in the mail for the local paper. I haven’t taken the paper in years, but the price was so low that I thought maybe I should give it a try. I feel guilty for knowing so little about my city and state, especially the politics and business. This Sunday I bought the paper as a test. I can’t find time to read it. One reason I cancelled the paper all those years ago is because they would pile up unread. Taking on any new activity requires shifting old ones around. That abundance of extra time I thought I’d have after retiring doesn’t exist. I figure it takes about an hour a day to properly read the paper. Especially if you want to value what it offers. Just quickly flipping the pages and scanning the headlines isn’t worth wasting its carbon footprint. But where would that hour come from? 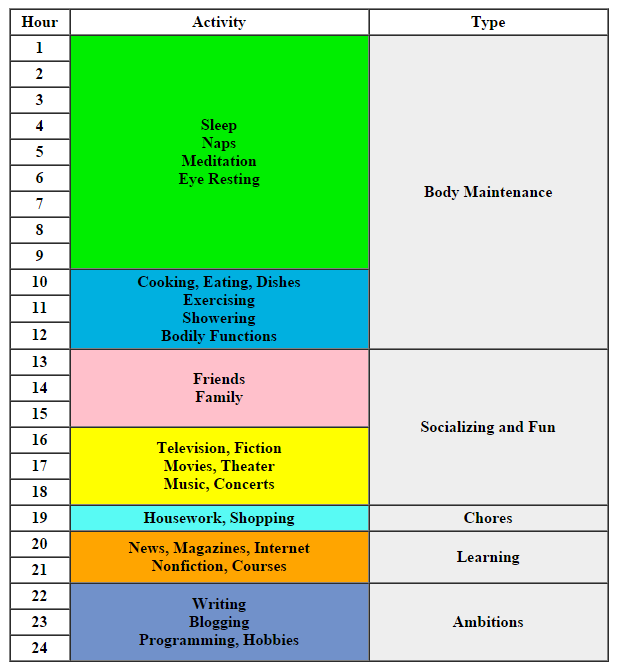 Either I’d have to expand into another activity’s timeslot, or I’d have to read less on the internet, magazines or books. It’s just not practical for me to take the paper right now. I could, but I’d have to become a newspaper reader and give up being an internet addict. That’s like becoming a different person. When you’re retired it feels at first like you have all the time in the world, but that’s not true. Half the day is taken up with body maintenance. Another quarter of the day is taking up with socializing and fun. I can’t remember I how squeezed in eight hours of work. Of course the numbers above are rough approximations. I’ve averaged them for the week. I often spend whole weekends in social activities, so I’m spreading activities across a single 24 hour clock as my pie chart. When I look at this schedule I realize why I’m not getting much writing done. Three hours a day feels about right for how I’m doing things now. I have to work hard to get those three hours. It’s very easy to just fill the day with all the other stuff. I could cut out two hours a day of television and give it to writing, but I’m not sure that would work. Watching two hours of TV before bed every night seems almost a necessity for my body and mind’s upkeep, as valuable as sleep and eating. My mind is shot for the last few hours of each day, so I don’t think I could do anything ambitious. And the older I get, the more reenergizing my cells need to keep going. All those naps and eye resting moments help recharge my batteries. I’ve recently read that sleep is the time when the brain flushes out toxic byproducts accumulated from mental activity during the day. That sounds true because when I take a nap it erases a mental fog that’s developed from writing. I’ve been thinking about taking on two new activities – drawing and studying math. I want to push myself to learn something completely new and different. Actually, I get impulses to pursue all kinds of new activities. Writing this essay makes me realize that I’m not devoting enough time to writing, and I shouldn’t take on anything new. But I think I will try learning to draw. I need to find other things to give up, because I think always learning one new thing is essential to mental wellbeing. Thus, I need to make room. What’s required is performing activity triage. I wonder if drawing is something I can do when I’m intellectually tired? I’m currently taking a Coursera course, “Learning How to Learn” based on A Mind for Numbers by Barbara Oakley. In the book and course she teaches techniques for more efficient learning. And I think her insights points to ways to solve my time management problems. Learning them will make me more efficient at pursuing all my ambitions. I need to stop wishing for more time, to stop hoping to can do more things, and learn to do fewer things, but being better at each, and doing so with greater efficiency. Jim, you are the least retired of any retired person I know. You seem to work at retirement. I just relax and enjoy life. They say that life is about the journey, not the destination. That’s especially the case when you’re retired, don’t you think? The destination, after all, is death. When you’re young, you need to prepare for life. But at my age, I just need to live it. We all live it in different ways, of course. Your scheduling makes me tired, just thinking about it. (I don’t even blog much, anymore, because… I simply don’t want to.) But if you enjoy that kind of thing, have fun! Do not, though, make your retirement years disappointing because you’re not accomplishing what you think you should be accomplishing. You’re not in the rat race anymore. You can stop running (if you want to; if you like to run, fine). Oddly I went through a similar process when I decided to get serious about writing. You can’t do everything!